We identify individual sites, often junctions or bends, where the number of injury accidents in the last five years was greater than a set threshold which is reviewed every year. 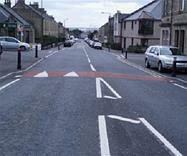 We also look at routes and areas where the accident rate is higher than would be expected. We then investigate the details of the accidents to try and identify patterns and develop engineering measures to try to solve the problems. The types of engineering measures can include new signs and markings, special road surfaces, changes to the road layout, new junction types and pedestrian crossings amongst other things. The schemes are then prioritised on the basis of their value for money in accident reduction terms. This ensures that the limited resources we have available are targeted where they will have the most benefit. Our schemes have proven to be a very cost effective method of reducing road accidents. We aim to publish the prioritised list of schemes around June each year. The latest report is available to view in the related documents section. The AIP programme is managed by the Road Safety and Traffic Management Team. The schemes are designed and implemented by the Transportation Projects team. Both teams are within Roads and Transportation Service based at Whitehill Service Centre, Bathgate. If there are any sites you are concerned about, please direct enquiries through the Customer Service Centre on 01506 280000.